Grape Sorbet is a purple "crelly" with silver and pewter hex-shaped glitters in different sizes and a slight shimmer. All nails are 2 coats with a top coat of Seche Vite. This polish a lot of fun because it's a nice twist on a my favorite color. ;) The glitters don't get lost in the base and stand out without being too in your face. Formula was great; it was the perfect consistency, dried quickly and I didn't need to fish for any glitter. 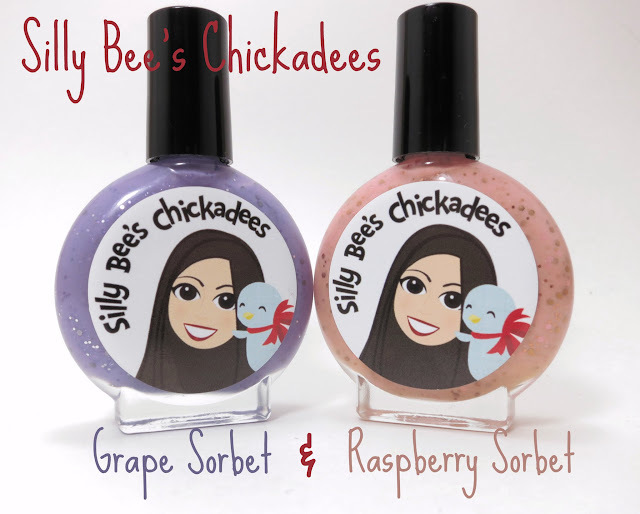 These Sorbets also make a great base color to layer other Silly Bee's polishes over! Here is 2 coats of Bananamelon Thump Cocktail layered over Grape Sorbet and a top coat of Seche Vite. Raspberry Sorbet is described as a slightly sheer dusty pink crelly with peach hex-shaped glitters in different sizes. The polish has some shimmer to it, but it isn't frosty. I used 2 coats and a top coat of Seche Vite. I decided to layer 1 coat of Azúcar over Raspberry Sorbet, just to kick up the femininity this color brings as a base color. Find Silly Bee's Chickadees on Etsy. The new sorbets are limited, so grab a bottle while you can! Make sure to follow Silly Bee's Chickadee's on Facebook and check out her blog!